Imagine yourself walking up to your fears and seeing them as the illusions they are. Have you ever been afraid that a goal was too far out of your reach? Have you ever started something but given up because it was too frightening? Have you been given opportunities that you didn’t act on out of fear? Do you want to do more in your life but can’t seem to make yourself move? By consciously conquering your fears through firewalking you’ll come out a stronger person. With firewalking you get to experience yourself taking action in spite of fears, and having the energy necessary to meet your goals and challenges. When you firewalk you do a lot more than just walk on hot coals, you build the mind body connection that demonstrates how your thoughts impact everything else in your life. After walking on fire and not getting burned, or seeing others walk on fire without injury your mind settles into a state of comfort and confidence. Walking on fire with comfort and confidence changes the chemical conditions within your body and provides you with unforgettable visual images to change your beliefs. This shifts your energy around fear. Empowerment ~ Knowing that you can do something that has always seemed impossible is hugely empowering. Trust me. And come find out for yourself. Courage ~ Feel the fear and do it anyway suddenly doesn’t seem like a platitude anymore. You have your own personal experience with walking through real fear and succeeding this builds courage! Vitality ~ We build the energy to meet the obstacle. When the obstacle is fire we build a lot of energy. This creates a burst of energy and vitality that you can take with you into your everyday life. Connection ~ It is a great bonding experience, families have come and firewalked together and changed their relationships dramatically, the bond of walking on fire with someone is a special and lasting bond. Restructuring Subconscious Beliefs ~ Subconscious beliefs are hard to shift, yet they run 90% of our decisions in life. This experience creates a powerful positive shift to thoughts and beliefs we don’t even know we hold. Physical Healing ~ Firewalking has been around for thousands of years and the primary use has been for personal healing or for the healer to build the energy that he then passes into the ailing person. Those experiences still happen today. Expansion of Possibilities ~ Doing something that is inexplicable and seemed impossible until you did it can’t help but open your mind to what else might be available to you. The great part is you don’t have to walk on fire to have the experience of expanded possibilities, just being there and witnessing others doing it is enough to have this effect. Rites of Passage ~ Our society had stopped marking important shifts in our lives. But marking a major change in your life with a trial, or self-test like firewalk, even if it is a sad trial such as divorce, you can shift the meaning and give it more purpose in your life. Everyone’s experience is unique, there are many ways to experience a firewalk. I hope I’ve covered enough of the experience to give you an idea whether firewalking is for you. We at Sacred Spirals have dreamed up an opportunity for you to experience firewalk here in Kansas City. 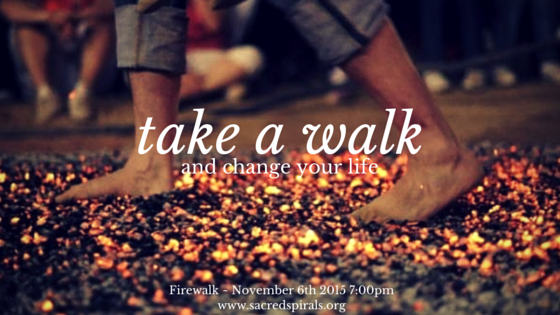 November 6th 2015 at 7:00pm we are presenting an evening of firewalk and live concert! We are bringing Stephanie Urbina Jones in from Nashville! She is a hit songwriter with a fantastic smoky voice, devastating good looks and a refreshing lack of music orthodoxy. Her newest CD is aptly titled “Fiery Angel” and she states that the music is about her own baptism by fire. Fueled by her difficult times she wrote though it all and came back with her heart singing, rising like a phoenix out of the ashes, living a more meaningful, grounded, and grateful life than ever before. She is going to start the evening off playing for us and getting us energized and inspired through her musical journey before she turns us over to Jeremy Pajer, the very gifted spiritual teacher who will be leading us thought our firewalk ceremony. Jeremy brings us his love of Native American Ceremony, Toltec wisdom and shamanic practices by pouring sweat lodges, teaching workshops and guiding firewalk ceremonies. He has dedicated his life to spiritual growth and the healing arts. Jeremy is truly a master of transformation and a gifted spiritual leader. We are thrilled to be bringing these two amazing individuals from Nashville to the greater Kansas City area to experience a one of a kind event. Tickets are available for $175.00 for the entire night. Doors open at 6:30pm. Light refreshments and beverages will be served. Click the image below to purchase tickets. If you have questions I have a short FAQ below that should answer the most common firewalk questions. If you have any other questions, please go to the contact us page on this website and send us an email. We will get back to you with answers to your questions as soon as possible. Is it real fire? Yes. The coals from the wood measure between 1200 and 2000 degrees Fahrenheit. Is there danger involved? Yes. Ceremonial initiations often include danger. This is what makes them rites of passage. When you are not sure that you have what it takes to get through a trying time, you are experiencing a rite of passage. There is always danger. Even if it is the danger of making a decision that you will later regret. But it is in walking through these dangers that we become empowered. Do I have to walk if I attend? No. While we do not allow spectators to come just to watch, we do not make anyone walk. You never know whether you will walk until you are standing in front of the fire. Some days the ‘window’ opens and you walk, other times you are a witness to the event. There is always a shift of perception and a new awareness whether you walk across the coals or not. How many times can I walk? It varies, depending on the number of people in attendance and the amount of time. But as long as the fire keepers keep the fire open you may get back in line and walk again. Previous postSept. 29 Radio Interview with Spirit Seeker Blog Radio! Want To Be Informed Of Future Events? Sept. 29 Radio Interview with Spirit Seeker Blog Radio! Sign up to stay informed by clicking our logo below.